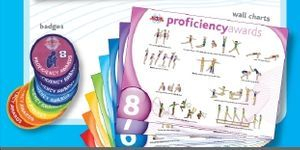 All recreational gymnasts at DGA have a personal British Gymnastics proficiency chart. There are 8 main levels (8-1) consisting of 10 skills on each level. Children start at level 8 and are assessed every 4 weeks. Once they have attained 8 of the 10 elements they have passed that level and may proceed onto the next level. Coaches will notify parents when a gymnast has passed a level and badges and certificates can be purchased at a price of £3.50 from the club. Once completed children will go on to work towards the British Gymnastics advanced proficiency award scheme (Bronze, Silver and Gold).